Young chickens. 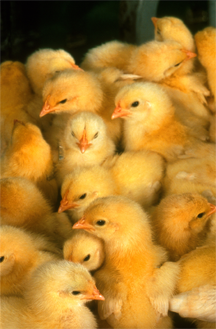 Because conditions like these are no doubt different from the conditions under which the chicken evolved, it is perhaps not surprising that salmonella and other microbes infect flocks housed in this way. So it is with the human members of virtual teams. Our biology and our societal patterns were designed for face-to-face interactions. That they don't work very well in the virtual environment is also perhaps not surprising. To recover the constraints that protect us from each other so well in face-to-face interactions, we must make our virtual environments more like our face-to-face environment. Photo courtesy United States Department of Agriculture Agricultural Research Service. In a fascinating paper about online behavior, psychologist John Suler identifies six factors contributing to what he calls the online disinhibition effect. Briefly, the environment of the Internet and other interactive media contributes to relaxation of inhibitions that suppress antisocial behavior. Team leads and those who charter teams can use Suler's work to guide them in taking steps that limit antisocial behavior in virtual teams. Conflict is essential to team success. We use conflict to transform the first batch of crazy ideas for solving a problem into the second batch of crazy ideas, which are usually a little less crazy than the first. This process continues until we finally identify promising approaches, including a few that actually work. Without such creative conflict sometimes called task conflict progress is impossible at worst, or slow and expensive at best. Toxic conflict is another matter. In toxic conflict, exchanges focus on personal attacks. One party might attack the other directly, or he or she might persuade others to shun or attack the target. Left to mature, toxic conflict destroys so many relationships that the team cannot function. Co-located teams are usually formed from the resident population, some of whom might have participated in prior toxic conflicts. These past conflicts are thus sometimes imported into new teams. In virtual teams, by contrast, conflict importation is more rare because the team's members are drawn from a more diverse population. Conflicts in virtual teams tend to be of the creative type early in the life of a virtual team. But over time, creative conflict evolves into toxic conflict more easily in virtual teams, in part, because of the online disinhibition effect (ODE). our face-to-face environmentcontributing to the ODE is what psychologists call dissociative anonymity. In the virtual environment, in contrast to real life, the connection between our personhood and our social actions is weaker than it is in real life. This weakened connection — dissociation — creates a sense of psychological freedom that enables us to say or do (or not say or not do) things that we wouldn't (or would) otherwise. Team leads and those who charter virtual teams can address this problem by strengthening the connection between team members' personhoods and their actions (or inactions). For example, having teams meet in person at regular intervals helps establish personal relationships that inhibit antisocial behavior. Cross-posting individuals from one site to another temporarily has a similar effect. Using videoconferencing instead of teleconferencing, or teleconferencing instead of email, also helps. For more on Suler's work, visit his Web site. For a lighter look at email in particular, see Daniel Goleman's article, "Flame First, Think Later: New Clues to E-Mail Misbehavior," from The New York Times, February 20, 2007. Would you like to see your comments posted here? rbrenfTvSAxmxSyJpngqoner@ChacSkKxxrNyamZKLiIjoCanyon.comSend me your comments by email, or by Web form. See also Conflict Management, Emotions at Work and Virtual and Global Teams for more related articles. I offer email and telephone coaching at both corporate and individual rates. Contact Rick for details at rbrenYgijQaOmRPQDAbAoner@ChacWEvCrcDtuHJxqsJuoCanyon.com or (650) 787-6475, or toll-free in the continental US at (866) 378-5470.